For over a thousand years, Eastern Christendom had as its center the second capital of the Roman Empire--Constantinople, the "New Rome," or Byzantium. The geographical division between the Eastern and Western Churches was only one manifestation of deeper rifts, characterized by a long history of conflicts, suspicions, and misunderstandings. Although the art, monasticism, and spirituality of Byzantium have come to be recognized as inspirational and influential in the shaping of Eastern European civilization, and of the Middle Ages and the Renaissance as well, the West has been in the main ignorant of the historical evolution and the doctrinal significance of Byzantine theology. Here, for the first time in English, is presented a synthesis of Byzantine Christian thought. The reader is guided through its complexities to an understanding of Byzantium: its view of man and his destiny of "deification"; its ability to transcend the "Western captivity"; its survival under quite adverse historical circumstances. In the end, he may well find himself receptive to the basic positions of Byzantine thought, which have attained, in this time of need for the reintegration of Christianity itself, a surprising, contemporary relevance. 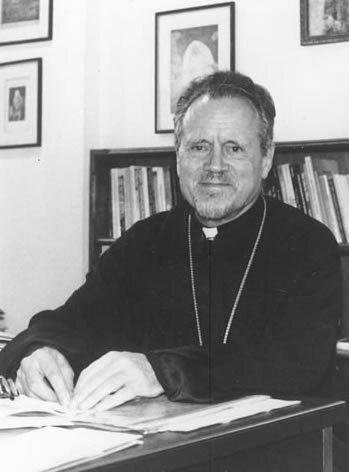 Protopresbyter John Meyendorff (February 17, 1926 -July 22, 1992) was a prominent 20th century Orthodox Christian priest, theologian, and writer. Born in Neuilly-sur-Seine, France, on February 17, 1926, ProtopresbyterJohn Meyendorff completed his secondary education in France and his theological education at the St. Sergius Orthodox Theological Institute (Paris, France) in 1949. In 1948 he also received a license-es-lettres at the Sorbonne, and later earned a Diplôme d'études supérieures (1949), a Diplôme de l'école practique des Hautes Etudes (1954), and a Doctorate of Letters (1958). In France he was an Assistant Professor of Church History at the Orthodox Theological Institute, and a Fellow at the Centre National de la Recherche Scientifique. Having been ordained to the priesthood in the Orthodox Church, he became Professor of Church History and Patristics at St. Vladimir's Orthodox Theological Seminary (Crestwood, New York) (1959), holding also successive joint appointments as lecturer in Byzantine theology at Harvard University, Dumbarton Oaks (to which he returned for a semester as Acting Director of Studies in 1977), and as Professor of Byzantine History at Fordham University (from 1967). He also was Adjunct Professor at Columbia University and Union Theological Seminary and lectured widely on university campuses and at church events. He held the position of Dean of St Vladimir's Seminary from March 1984 until June 1992. A widely published scholar (see bibliography below), Fr Meyendorff's books have been published in a number of languages, including French, German, Italian, Russian, Greek, Finnish, Spanish, Dutch, Japanese, Serbian, and Polish. Fr Meyendorff was a member of several professional associations, serving during different periods as President of the Orthodox Theological Society of America, President of the American Patristic Association, and a member of the Executive Committee, U.S. Committee for Byzantine Studies. He was a Fellow of the National Endowment for the Humanities (1976-77), and a Guggenheim Fellow (1981). As a representative of the Orthodox Church, he participated in the activities of the World Council of Churches, having been Chairman of the Commission on Faith and Order (1967-1976) and a member of the Central Committee. Committed particularly to inter-Orthodox unity and cooperation, he was one of the founders and the first general secretary of Syndesmos (World Fellowship of Orthodox Youth Organizations), and served later as its president. Fr Meyendorff held honorary doctorates from the University of Notre Dame and General Theological Seminary, and was a Corresponding Fellow of the British Academy. He was a Senior Fellow at Dumbarton Oaks. The Diploma of Honorary Member of the Leningrad Theological Academy was bestowed upon Fr John in May of 1990. In June 1991 Fr John was awarded the Order of St Vladimir, 2nd Class, by His Holiness Alexei II, Patriarch of Moscow and All Russia. Fr John Meyendorff retired as Dean of St Vladimir's Seminary on June 30, 1992. He died on July 22, 1992. From the 9th until the 11th of February, 2012, St. Sergius Orthodox Theological Institute (Paris, France) will hold an International Conference to commemorate the twentieth anniversary of the falling asleep in the Lord of Protopresbyter John Meyendorff. For a complete description of the international conference, including the detailed program and registration form, visit the Conference blog and the Website of St. Sergius Orthodox Theological Institute. Rome, Constantinople, Moscow: Historical and Theological Studies. Crestwood, NY: SVS Press, 1996; 2003. Unité de l'Empire et divisions des chrétiens, Paris: Editions du Cerf, 1992; tr. of Imperial Unity and Christian Divisions. The Primacy of Peter: Essays in Ecclesiology and the Early Church, rev. ed. Crestwood, NY: SVS Press, 1992. Imperial Unity and Christian Divisions: The Church 450-680 AD. Crestwood, NY: SVS Press, 1989. Vision of Unity. Crestwood, NY: SVS Press, 1987. Witness to the World. Crestwood, NY: SVS Press, 1987. Le Marriage dans la Perspective Orthodoxe. Paris: YMCA Press, 1986; tr. of Marriage, an Orthodox Perspective. Vizantijsko Bogoslovje, Kragujevac, 1985; tr. of Byzantine Theology: Historical Trends and Doctrinal Themes. Byzantine Theology: Historical Trends and Doctrinal Themes. New York: Fordham, 1983. 2nd ed., 2nd printing with revisions. Catholicity and the Church. Crestwood, NY: SVS Press, 1983. Sveti Grigorije Palama ipravoslavna mistika. Beograd, 1983; tr. of St Grégoire Palamas et la mystique orthodoxe. Catholicity and the Church, 1983. The Byzantine Legacy in the Orthodox Church. Crestwood, NY: SVS Press, 1982. Byzantium and the Rise of Russia: A Study of Byzantino-Russian Relations in the Fourteenth Century. Cambridge: Cambridge University Press, 1981. The Orthodox Church. Crestwood, NY: SVS Press, 1981; 3rd rev. ed. The Byzantine Legacy in the Orthodox Church, 1981. Byzantium and the Rise of Russia. A Study of Byzantino-Russian Relations in the Fourteenth Century. Crestwood, NY: SVS Press, 1989; reprint of Cambridge ed. of 1980. Byzantine Theology: Historical Trends and Doctrinal Themes. New York: Fordham University Press, 1979; 2nd ed. Living Tradition. Crestwood, NY: St Vladimir's Seminary Press, 1978. St Grégoire Palamas et la mystique orthodoxe. Paris: Editions du Seuil, 1976. Byzantine Theology: Historical Trends and Doctrinal Themes. London: Mowbrays, 1975. Christ in Eastern Christian Thought. Crestwood, NY: SVS Press, 1975; tr. of Le Christ dans la theologie byzantine. Initiation a la theologie byzantine: Htistoire et la doctrine. Paris: Cerf, 1975; tr. of Byzantine Theology: Historical Trends and Doctrinal Themes. Byzantine Theology: Historical Trends and Doctrinal Themes. New York: Fordham University Press/London: Mowbrays, 1974. "Le Christ dans la theologie byzantine," Bibliotheque oeumenique, 2. Serie orthodoxe. Paris: Editions du Cerf, 1969. Christ in Eastern Christian Thought. Washington, DC: Corpus Books, 1969; tr. of Le Christ dans la theologie byzantine. L'Eglise Orthodoxe: hier et aujourd'hui, 2nd ed., rev. Paris: Editions du Seuil, 1969. La Iglesia Ortodoxa: ayery hoy. Paris: Desclée de Brouwer, 1969; tr. of: L'Eglise Orthodoxe: hier et aujourd'hui. Sv. Grigorii Palama i pravoslavnaia mistika, 1969; tr. of St Grégoire Palamas et la mystique orthodoxe. Orthodoxy and Catholicity. New York: Sheed & Ward, 1966; tr. of Orthodoxie et Catholicité. Orthodoxie et Catholicité. Paris: Editions du Seuil, 1965. De Orthodoxe Kerk, roermond-maaseik, J.J. Romen & Zonan Vitgevers, 1964; tr. of L'Eglise Orthodoxe, hier et aujourd'hui. Die Orthodoxe Kirchegestem undheute. Salzburg: Otto Muller Verlag, 1963; tr. of L'Eglise Orthodoxe, hier et aujourd'hui. The Primacy of Peter, with N. Afanassief, et al. London: Faith Press, 1963; tr. of La primauté de Pierre dans l'Eglise Orthodoxe. La Chiesa Ortodossa, hieri e oggi. Brescia: Morcelliana, 1962; tr. of L'Eglise Orthodoxe, hier et aujourd'hui. The Orthodox Church: its Past and its Role in the World Today. London: Darton, Longman & Todd/New York: Pantheon Books, 1962; tr. of L'Eglise Orthodoxe: hier et aujourd'hui. Der Primat des Petrus in der Orthodoxen Kirche, with N. Afanassief, et al. Zurich: EVZ-Verlag, 1961; tr. of La primaute de Pierre dans l'Eglise Orthodoxe. L'Eglise Orthodoxe, hier et aujourd'hui. Paris: Editions du Seuil, 1960. Die Orthodox Kirche: gestern und heute. Salzburg: Muller, 1960; tr. of L'Eglise Orthodoxe: hier et aujourd'hui. "Grégoire Palamas. Defense des saints hesychastes: Introduction, text critique, traduction, et notes." Louvain: "Spicilegium sacrum lovaniense," 1959; administration, ed. and tr., v. l, 383, v. 2, 383-767. "Introduction a l'étude de Grégoire Palamas," Patristica Sorbonensia, v. 3. Paris: Editions du Seuil, 1959. "St Grégoire Palamas et la mystique orthodoxe," Maitres spirituels, n. 20. Paris: Editions du Seuil, 1959.